In this tutorial you are going to learn the simple process for adding a sparkle in photoshop which can really enhance a photograph. In Photoshop make sure that you have the photo you want to add the sparkle to open. 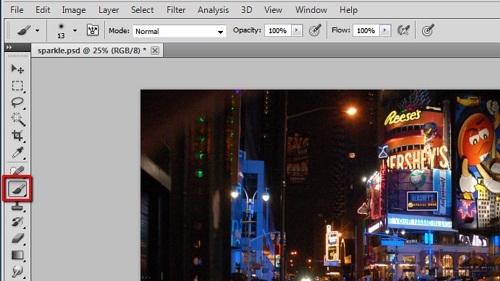 This will always work better with a night scene so that is what we have chosen in this example. Now click on the brush tool in the tool selection on the left. Right click anywhere on the image and you will see the brush selector, scroll about halfway down the options until you see the sparkle brushes. Choose anyone of these. You will also need to select a size for the brush, this will depend on the resolution of your image so it will require a bit of experimentation to get right. Here we find that a size of 70 pixels is a good start. You should make sure that the brush color is white. 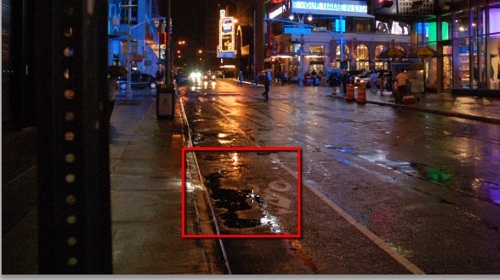 Now locate an area on the image to add a sparkle, areas close to light sources and water work well. Here we will add some small sparkles to the puddles. A single click adds a very small sparkle and to make it brighter simple click multiple times. Larger sparkles can also be effective. 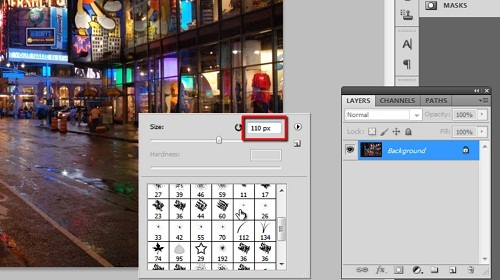 Right click again to bring up the brush options and increase the pixels size – again the size you choose will depend on the resolution of your image. Here a size of around 110 pixels will work. This size brush will work best for use on light sources, so let’s repeat the clicking process for some of the lamps and car headlights in this photo. As you can see the sparkle brush enhances them nicely and that is how to add sparkle in photoshop.